Indian Clay Curry Pots, or Manchatti, Meenchatti or simply Chatti, are earthenware pots which are very traditional in Kerala's cooking. They are present in almost every household, some handed down from generation to generation. They are also wildly popular in Malayan cooking. They are used in the making of fish curry and an important element in uplifting the flavors of any fish curry. Somehow, fish curry cooked in the earthen pot brings out the taste of fish curry to perfection. 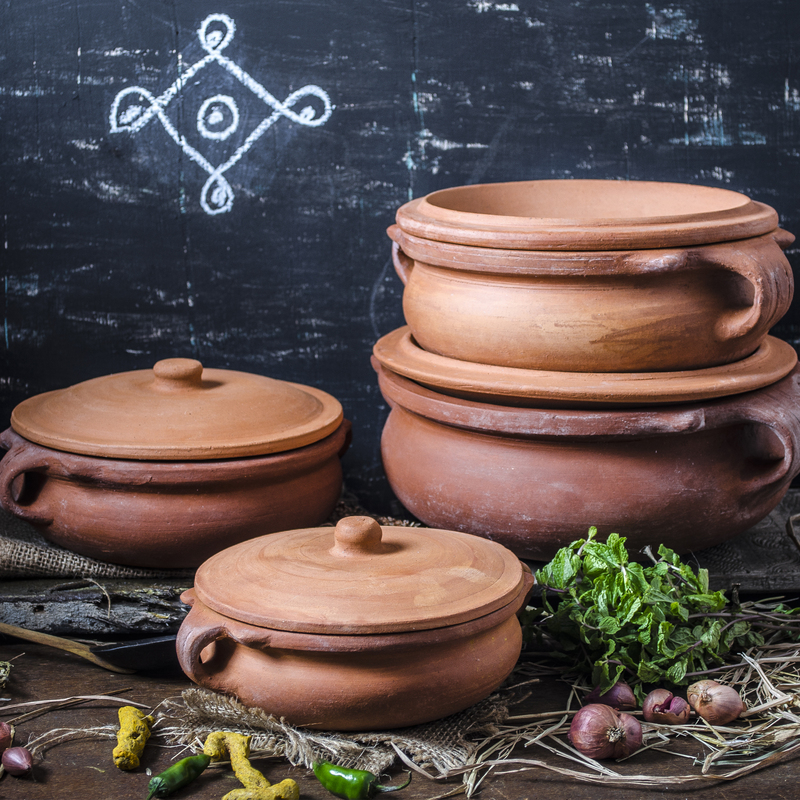 These Clay Curry Pots are hand crafted by our artisans in Tamil Nadu and very traditional. The pots are unglazed, and totally free of any toxic materials or lead and 100% Eco friendly. These Clay Curry Pots are handmade by artisans and very attractive in design. The clay may have markings and imperfections, however these imperfection do not compromise the aesthetics or functionality of the pieces and are considered normal and to be expected. Although the lids seat properly on the pot, they may not always fit perfectly so as to seal the pot as with metal ones. Our Clay Curry Pots can be used in the oven, microwave, stovetop, of direct fire. They also serve as a serving vessel and can go directly to the table for an authentic presentation. As with any clay or glass cookware, the pieces must not be submitted to drastic changes in temperature. The pieces should be allowed to adjust slowly to heat, letting the pieces slowly heat up until they are hot, either on the stove or in the oven. Likewise, you should also allow the pieces to adjust to room temperature before washing or storing them, and never sit a hot pot on a cold surface such as granite or tile. The Pieces should never be put in a dishwasher as they can absorb the detergent flavor, instead they should be hand-washed with mild soap. If the piece is heavily soiled, fill the piece with warm soapy water and allow them to soak briefly, then scrub them lightly with a sponge or soft cloth. Never use metal or abrasive cleaners, and always try to avoid strongly scented soaps which can flavor the clay. Never use metal utensils, as it can scratch and damage the inside of the pieces, using wooden utensils instead. The Indian Clay Cookware we sell is made by our artisans in Tamil Nadu Indian. It is a time consuming and laborius task. We hope you enjoy see the video on how they are made. This recipe is original of the Kerala region, and normally made in Clay Curry Pots or "manchatti". An essential ingredient is Kudam puli which also known as Gambooge, Malabar Tamarind, Fish Tamarind etc., can be purchased at Indian grocery stores, along with most of the other ingredients. It is a sour the dried fruit and is used as a souring agent in fish curries and other seafood preparations from Kerala. Loved it..I was little hesitant to buy it as I was not sure how it`s gonna arrived. But it came beyond my expectation. Came in excellent packaging condition. Flavour comes out very good. Very happy with the purchase. Definitely going to recommend this. Excellent customer service.. Very quick to resolve the issue and the pot is Great!! Recommended!! I like my clay pot I didn`t use it yet .I`m going to use it during the holidays time. I will tell all my friends and family about the clay pot is a fabulous .